Bellacures Nail Salon shares how to get the “Politicure” featuring either an elephant or donkey, depending on your client’s political leanings. 1. Paint all nails red or blue depending on your political preference, leaving one nail unpainted. 2. Paint the unpainted nail an opaque white like OPI Alpine Snow. 3. Let the white nail fully dry. 4. 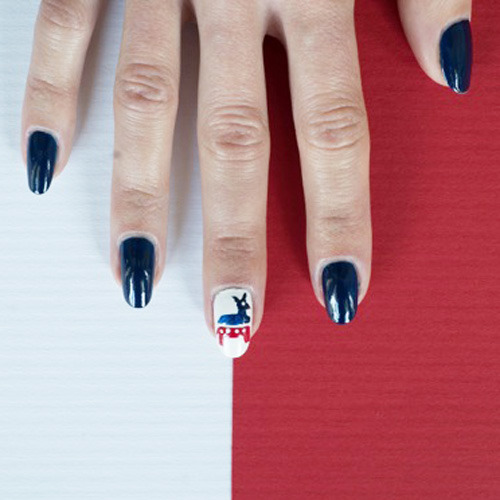 Use these images to help you draw a simple elephant or donkey in red and blue on the nail that is painted solid white. Use a thin paint brush for precision. You can draw small white dots as as details instead of stars, or use nail glue to adhere small rhinestones for a little bling. 5. Let the nail art fully dry for 20 minutes. 6. Apply top coat on all nails, and voila, the politicure!